OneCard Nigeria has introduced N20 and N50 recharge cards into the market. The excitement even gets better as the new recharge cards tops up all mobile networks; Airtel, Etisalat, Glo and MTN. • When you just need some “FLASHING” power. 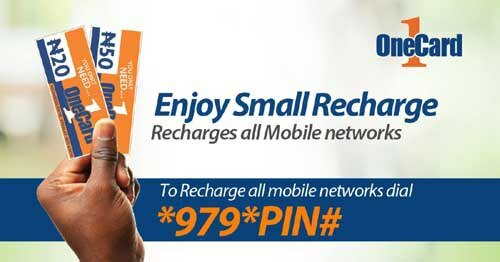 Best part is that you use the same USSD code *797*PIN# to recharge on all network. The recharged amount can be used for calls as well as data subscription on all MTN, Airtel, Etisalat and Glo networks. Now everyone is free at last to recharge without limitation. OneCard is available across Nigeria. Ask your recharge vendor for OneCard. It is the orange and blue recharge card with One1Card written on it. If you are a business looking for a micro collection solution or an easy way to collect money for the services you provide, then this multi-purpose recharge will also meet your need.